In the mid 1990s Dariush Mehrjui made three successive films (Sara, 1993, Pari 1995, and Leila, 1997), each focusing on an Iranian woman trying to find fulfillment in a society not normally attentive to a woman’s efforts towards self-realization. The first two films of this trilogy, Sara and Pari, were based on well-known works of Western literature and adapted to Iranian circumstances. 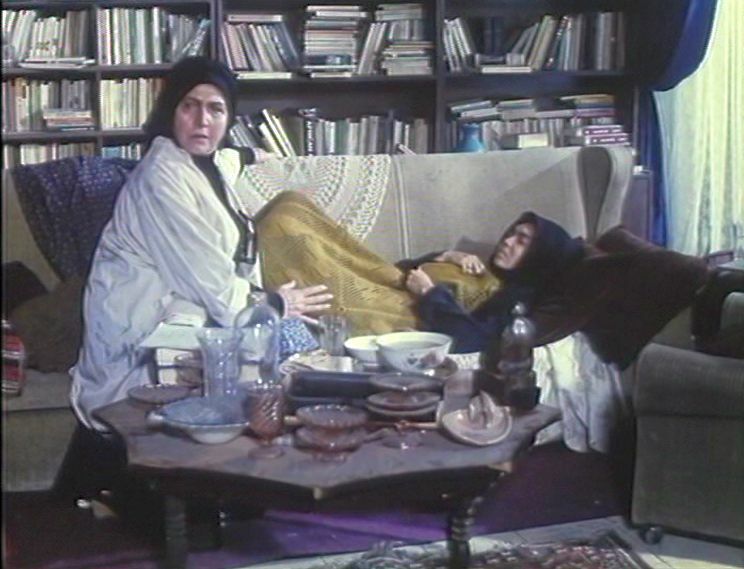 In the case of Sara, which was based on Ibsen’s A Doll’s House, the adaptation was straightforward, since the Iranian social context matched well with the 19th century social environment described by Ibsen. But Pari, which was based on works by J. D. Salinger, was a more difficult stretch, and I would say not so successful. Even so, Pari stands (as does Salinger’s work in general) as an interesting attempt to deal with philosophical/spiritual struggles, and it deserves more than passing consideration. Normally, I concentrate on a film’s own narrative, as it stands, and pay little attention to its original sources from other media. However, in this case I will make some explicit comparisons with Salinger’s relevant stories – “Franny” (1955) , “Zooey” (1957) , and “A Perfect Day for Bananafish” (1948) . 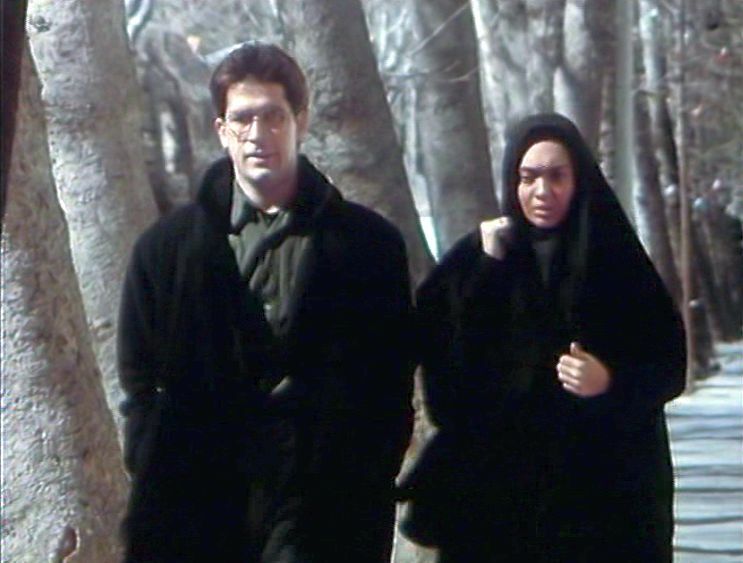 Although there are necessary changes to fit Salinger’s stories into an appropriate Iranian context, it is surprising just how closely Mehrjui’s film matches up with Salinger’s work and in some places is almost a literal transcription. Since Iran had no copyright relations with the United States, there were no contractual agreements made at the time of production. Nevertheless, Salinger, who was always litigious about his intellectual property privileges, managed to have his lawyers block a planned screening of Pari in the New York in 1998. As useful background information for this work, it is worth pointing out that across the relatively sparse literary output over the course of Salinger’s life, many of his stories concern various experiences of the fictional Glass family over a period of years in mid-20th century New York City . In particular, the family focus is on the Glass family’s seven precociously intellectual children, particularly (in descending orders of age) Seymour, Buddy, Zooey and Franny, all of whom appear in altered form in the film Pari. The 1948 suicide of Seymour Glass, the oldest and most charismatically brilliant of the Glass children, is described in Salinger’s “A Perfect Day for Bananafish”, the story that launched Salinger to literary stardom. Parts of this story, though in altered form and set later in time, are depicted in Pari. But for the most part, Pari reflects the two stories, “Franny” and “Zooey”, which Salinger set close together in time in 1955. Together, those two stories relate the development of Franny’s spiritual crisis, which was occasioned by her reading a 19th century book, The Way of a Pilgrim, which she found on Seymour’s long unattended bookshelf. The Way of a Pilgrim and its sequel, The Pilgrim Continues his Way, describe the spiritual journey of a wandering mendicant monk in Russia who finds spiritual bliss by ceaselessly repeating the Jesus Prayer ("Lord Jesus Christ have mercy on me") as a mantra. Franny, who is about 21 years old, then has long discussions in this connection with her brother Zooey, who is four years older. Although Seymour had died seven years earlier, considerable reference is made to his strong intellectual influence on both Zooey and Franny in those two stories. Transferring a written fictional story into film often presents problems to the filmmaker, particularly in connection with how to present cinematically the thoughts of the characters that were described in prose in the original text. In this respect Salinger’s prose would seem to offer some advantages, since overt conversations dominate over internal monologues in his stories. But with Salinger, the long conversations are taken to the limit, and in his stories occupy almost the entire story space; there is very little depiction in the way of physical action or movement. Mehrjui does his best to depict as much of this conversational material as possible in cinematic action, but there are limits to what can be accomplished in this respect. Another issue that had to be dealt with was that Salinger’s stories are anchored in the intellectual New York cultural milieu heavily influenced by its Jewish population . Translating the wise-cracking New York social culture banter into an Iranian Islamic context was a real challenge, which turned out to be only partially met successfully. Despite these difficulties, though, it is surprising to me to see just how faithful many of the scenes in Pari are to the Salinger’s original text. The film begins with two scenes that are drawn from the story “Zooey” and can be understood within the conversational context in that story but appear to be quite mysterious and without explanation in Mehrjui’s film. In the first such scene, Pari is shown in a swimming pool and being pushed down under the water by her companions (this was a dream that Franny relates in Salinger’s story). In the second mysterious scene, Pari is shown entering an empty college classroom and obsessively filling the blackboard with philosophical epigrams, after which she erases the entire blackboard. This is also described in context in “Zooey”, but is totally unmotivated here in the film. Pari is then shown in her college, expressing intense dissatisfaction with the arrogance and pedantry of her college philosophy professor, who is lecturing the class on Khayyam and Rumi. She seems to feel that her teachers are merely posturing and not penetrating to the ultimate truths of these great thinkers. Fed up with what is going on around her in Tehran, she decides to take a bus to Isfahan and visit some family members and her fiancé there. Her fiancé meets her at the bus station and starts talking about his own intellectual endeavors at his university, which account Pari also finds boring and self-serving. 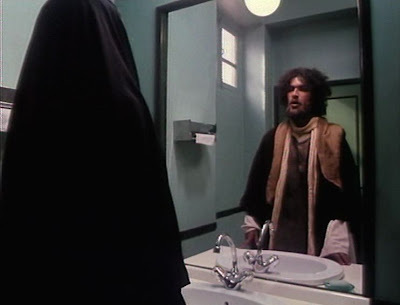 They then go to a restaurant, and Pari tells her fiancé about the Sufi book she has been reading (this book is like The Way of the Pilgrim, but here it describes a wandering monk in Khorasan and his repetitive prayer makes reference to God, not Jesus). 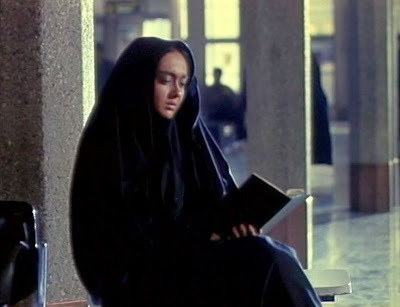 The Sufi book that Pari has discovered has pointed her to a new way of conscious engagement with her surroundings that is entirely different from the academic detachment that she has found so dissatisfying and pseudointellectual at the university. In fact the Sufi-inspired mantra-prayer technique is entirely distinct from any intellectual contemplation of God. You don’t even have to believe in what you are doing; you are simply instructed to endlessly continue the repetitive chanting. The argument goes that if one continues the practice, whether believing in it or not, one will be transformed into a sublime state of consciousness. The technique has similarities with the Brahmanic “Om”, Zen “No-Mind”, and Tibetan Buddhist chanting, which suggests that it has been rediscovered many times and in many places around the world. Pari tries to tell her fiancé how important her mantra-prayer has become to her and how it reflects truths from other religions, such as Buddhism, but her fiancé is dismissive and merely asks her, “do you really believe this stuff?” Under increasing emotional stress, Pari rushes out to the restroom and eventually faints. She is taken back home and after witnessing the death of an aged relative, decides to go back to Tehran. 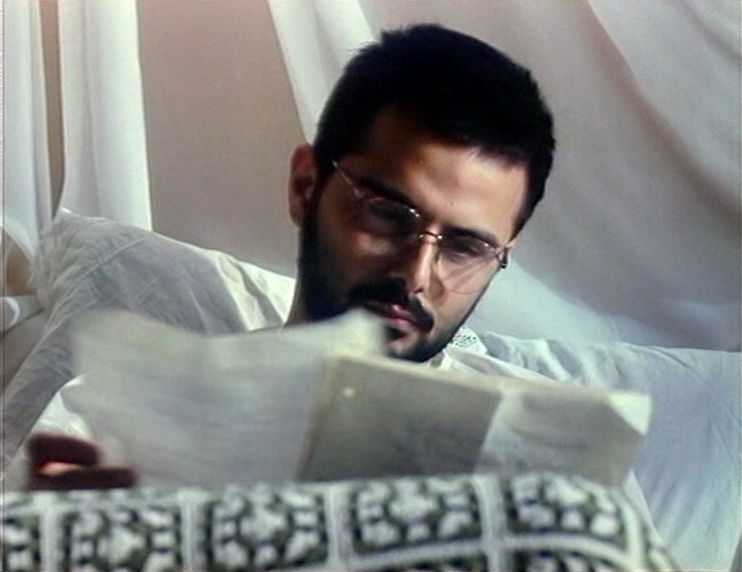 The film now cuts to Dadashi in Tehran, who is reading a long letter from his brother Safa. 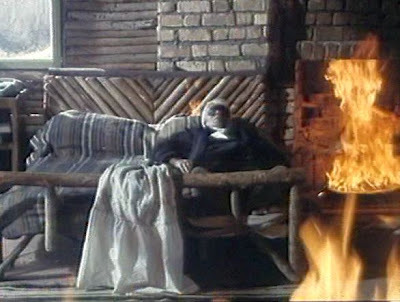 In this scene there is an account from Safa's perspective of Assad’s mysterious suicide by self-immolation. Dadashi’s mother approaches him and asks him to see if he can straighten out Pari, whose spiritual crisis is now taken to be a nervous breakdown. Dadashi goes ahead and finds Pari sleeping on the couch, and he launches into a long conversation with her about the books she has been reading. In this sequence, Dadashi comes across as rather dogmatically overconfident, as he insists that Pari should surrender to God (Ali’s teaching), rather than succumbing to the arrogance of selfishly trying to find her salvation on her own and make her own judgments. Pari is unconvinced by Dadashi’s rants and urges him to leave her alone. Dadashi now enters Assad’s old study and examines some of his brother’s old notebooks. 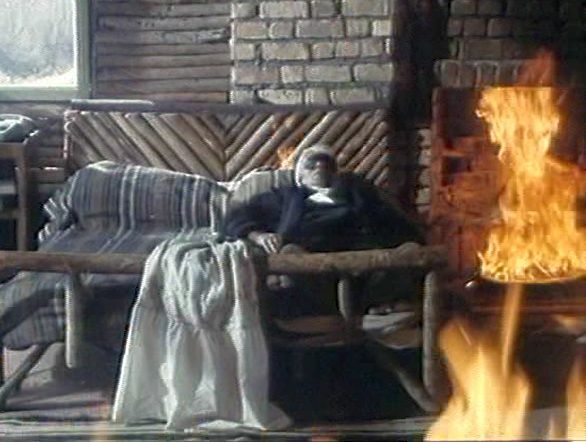 The scene then moves to a depiction of Assad’s suicide some years earlier. Assad in this sequence is shown to be generally benign and thoughtful, but he has apparently reached some irreversible level of philosophical despair. He speaks cordially to small child that he meets and then quietly and deliberately arranges his self-immolation. Dadashi approaches Pari again, this time by calling her on the phone and pretending that he is Safa. When Pari sees through that ruse, she runs away. This sequence of the film then diverges from Salinger’s text, as Dadashi finds Pari and dramatically challenges her to burn herself alive as Assad had done. 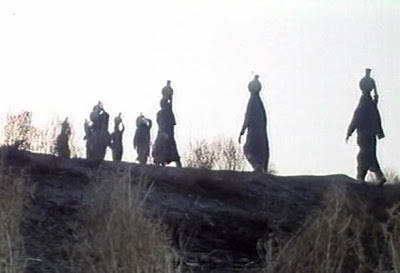 The film closes with Pari acceptance of Dadashi’s retelling of Safa’s story that if one is dying on a hillside with his throat cut and a bunch of women walk by carrying jugs on their head, one should still be able to sit up and see how the women carry their jugs safely over the hill. On the whole, Pari doesn’t manage to capture the charm of Salinger’s Franny and Zooey. For one thing, the Dadashi character is just a bit too pushy and arrogant in this depiction. The New York energy of Zooey fails to translate into an acceptable Iranian equivalent. Similarly, Niki Karimi’s Pari character is bit too intense and strained to gain a sympathetic audience here. And the intellectual repartee of the story doesn’t generally come across. The first part of the film, though, which essentially shows Salinger’s "Franny” story, is more successful. Here the characteristic Salinger concern about phoniness and authenticity, and the inevitably accompanying awareness that an obsession about other peoples’ phoniness becomes, itself, an affectation, is reasonably well portrayed. Another thing that I liked was Mehrjui’s ending to the film. 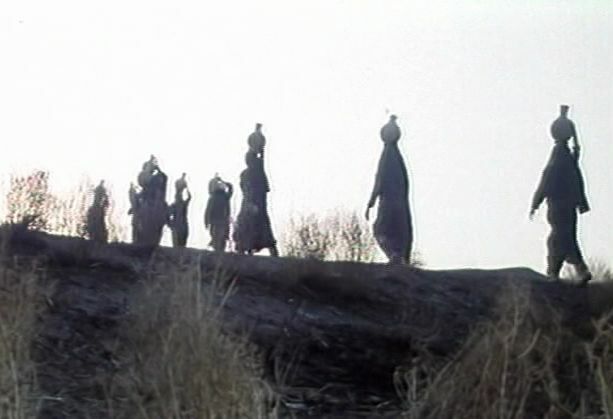 The film's closing story about the women jug bearers actually comes earlier in Salinger’s story “Zooey”, as something of a passing reflection on the part of Buddy (Safa in this film). In the movie, though, Merhjui has elevated this curious metaphor to a final image that stands for acceptance of, and ultimately embracing, life’s eternal mysteries. In this finally enlightening perspective, Pari’s ceaseless prayer is shown to be simply a way to maintain one’s meditative immersion in the immediacy and wonder of life, as it happens right in front of us all the time. J. D. Salinger, “Franny”, The New Yorker, January 1955. J. D. Salinger, “Zooey”, The New Yorker, May 1957. J. D. Salinger, "A Perfect Day for a Bananafish," The New Yorker, January 1948. “Glass Family”, Wikipedia, http://en.wikipedia.org/wiki/Glass_family (accessed May 17, 2013). “History of Jews in New York City”, Wikipedia, http://en.wikipedia.org/wiki/History_of_the_Jews_in_New_York_City (accessed May 16, 2013). Are you sure the film means what you think it means?